On April 6, 2014, Dr. Cu Huy Ha Vu — one of Vietnam's most prominent prisoners of conscience — was released from Prison No. 5 in Thanh Hoa province, where he had served half of a seven-year sentence. On April 8, 2014, Dr. Vu and his wife, Nguyen Thi Duong Ha, arrived by plane in the United States, where Dr. Vu will reportedly be provided medical treatment. A prominent government critic and legal activist,, Dr. Cu Huy Ha Vu was arrested on November 5, 2010 and sentenced to seven years' imprisonment in April 2011 on charges of "propaganda against the state" under article 88 of the penal code. Dr. Vu is a constitutional scholar and human rights defender known for his public criticism of high-ranking government officials and the unprecedented lawsuits he filed against the Vietnamese government. Dr. Vu answers questions from the press in Washington, D.C. on May 6. In 2009 Dr. Vu sued Prime Minister Nguyen Tan Dung for violating laws of environmental protection, national security and cultural heritage by approving a Chinese-run bauxite mining project in the Central Highlands. His law firm provided legal assistance to democracy and religious freedom activists, including Catholics from Con Dau parish in Da Nang who protested government confiscation of church properties. 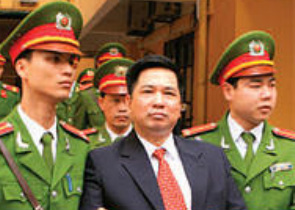 Cu Huy Ha Vu was sentenced to prison in 2011. Background: A 2011 report by Human Rights Watch, "Vietnam: The Party vs. Activist Cu Huy Ha Vu," provides comprehensive background and analysis of the arrest and trial of Dr. Cu Huy Ha Vu. Cu Huy Ha Vu is a constitutional scholar who twice sued Vietnam’s current prime minister for unlawful conduct. Since his release from a Vietnamese prison last month, he has lived in Northern Virginia. Facing mounting pressure by the international community and seeking trade and security commitments, the Vietnamese government recently released five prisoners of conscience. I was one of them. Such releases are always welcome, but they should not be confused with actual human rights improvements. There are an estimated 400 prisoners of conscience in Vietnam. Even as a handful of dissidents were released, a larger number were detained or sentenced to prison terms. Many in Southeast Asia believe that Vietnam has replaced Burma as the region’s worst violator of human rights. The international community often focuses on pressing Vietnam for more prisoner releases. While I benefited from such attention, it often backfires as a diplomatic approach. The Vietnamese government treats prisoners of conscience as commodities to barter with the United States and other Western countries for security and trade benefits as well as foreign aid. Vietnam has stocked a reserve of prisoners of conscience for future bargaining. After Vietnambecame a member of the World Trade Organization and gained permanent normal trade relations with the United States in early 2007, the Vietnamese government launched a brutal crackdown that has swept up intellectuals, artists, bloggers, journalists, labor activists and religious leaders. It goes on to this day. Governments in the free world should demand that the Vietnamese government dismantle its arsenal of instruments for repression — starting with the repeal of Articles 79, 88 and 258 of its penal code — and link future trade and security benefits to such legal reforms. It is not too much to ask: These laws are not only a violation of the International Covenant on Civil and Political Rights — to which Vietnam has been a party since 1982 — but also contradict the Vietnamese constitution. The sole purpose of these laws is to ensure the survival of the regime of the Vietnamese Communist Party. Article 88, which prohibits “propaganda against the State of the Socialist Republic of Vietnam,” silences critics of the party — journalists and bloggers and other dissidents. This is a direct violation of Article 16 of the constitution, which says “no person shall be discriminated against in political life” — in other words, no one may be harassed or persecuted, much less arrested or jailed, because of political views that are contrary to the views of the state. Article 258, meanwhile, targets those “taking advantage of the right to democratic freedoms in order to violate the interests of the State.” Vietnam has no true “democratic freedoms,” but its constitution promises citizens their rights to freedom of expression, information, religion, assembly and association. “Taking advantage” of one’s rights is a notion the government concocted to undermine the constitution so that the only real freedom Vietnamese citizens have is to completely agree with the Communist Party’s policies. While Articles 88 and 258 target individual dissidents, Article 79 is designed to prevent dissidents from organizing themselves to compete politically. This law is used against anyone who peacefully organizes to oppose the party’s dominance or its policies. Independent labor unions, nascent political parties, religious organizations, civil society associations that refuse to submit to government oversight — all can be crushed by Article 79. Two-thirds of the known prisoners of conscience are imprisoned under these three articles, including Nguyen Van Hai (blogger Dieu Cay), Catholic priest Nguyen Van Ly, Protestant pastor Duong Kim Khai, Ta Phong Tan, Ho Thi Bich Khuong, Vo Minh Tri, Nguyen Van Lia, Dang Xuan Dieu and Tran Huynh Duy Thuc. While these names may not be familiar to many here in the United States, they are heroes to those of us who want to build a Vietnam that is both prosperous and protects fundamental human rights and the rule of law. My residence in the United States affords me the freedom to express my opinions, and for that I am most grateful. Thus, I respectfully urge the U.S. government to use all relevant bilateral and multilateral venues, including negotiations on trade and security as well as loans from international financial institutions, to seek the immediate repeal of Articles 79, 88 and 258, and the unconditional release of all prisoners of conscience charged under these articles. Only by dismantling the instruments of repression will there be real and irreversible improvements in human rights in Vietnam. In a Vietnamese-language statement released in advance of the U.S.-Vietnam Human Rights Dialogue, Dr. Cu Huy Ha Vu called on the U,S. government to press Vietnam to repeal articles in its penal code that violate international law and Vietnam’s constitution, release all prisoners of conscience, and strictly abide by the UN Convention Against Torture. "There are several reasons why Dr. Vu’s case may well evolve into one of the most important cases involving a political dissident in the recent history of the Socialist Republic of Vietnam. "First, Dr. Vu comes from a prominent family that includes high-ranking members of the Vietnamese Communist Party (VCP), revolutionary heroes, famous poets, and high-level government officials. "Second, his family has waged a vigorous fight for his freedom, especially his wife, lawyer Nguyen Thi Duong Ha, and his sister, Cu Thi Xuan Bich. His defense team launched creative legal maneuvers such as requesting the presence of Vietnam’s president, Nguyen Minh Triet, at his trial on the grounds that as president he should be present to represent the “victim” and plaintiff in the case, the Socialist Republic of Vietnam. "Finally, unprecedented popular support for Dr. Vu has emerged and continues to grow online from diverse sectors of Vietnamese society, including Catholic parishioners from Hanoi and Nam Dinh; urban bloggers, academics, writers, journalists, and dissidents; senior Vietnamese Communist Party members; technocrats, land rights petitioners, and ordinary citizens such as teachers, small business owners, workers, farmers, and taxi drivers."